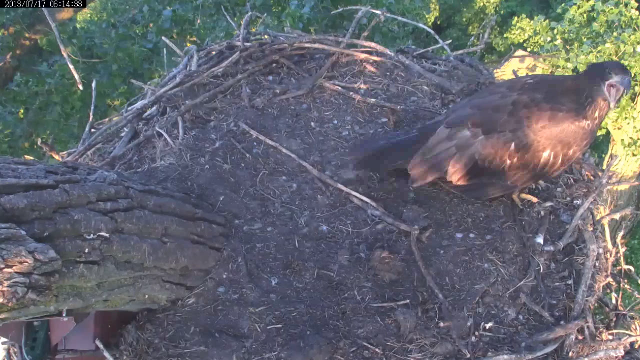 Nest Update July 17, 2013 - Is That An Empty Nest We See? Twas a very quiet day at the nest. Well, in terms of action that is. The kids have taken to perching out of camera range and squeeing their little lungs out. Or moving far away and squeeing just enough to be heard. Oh Well! Peace was on the nest early today bouncing around and letting it be known she was hungry (what else is new). Harmony must have had flying lessons this morning as she wasn’t seen until mid-afternoon. About 2:30PM both landed on the nest and a Parent could be heard in the tree. They both took off again and Harmony returned fairly quickly. Peace landed shortly after and Harmony gave her the bums rush and both went over the right side of the nest. Peace was the one to return fairly quickly this time. A short time later a Parent (Mom?) landed with a tasty fishy and the race was on. Peace mantled and scored the fish. Harmony landed seconds later and Peace saw her and decided to get the heck out of Dodge. Peace dove off the left side of the nest with the fish and Harmony was in loud and hot pursuit. Harmony came back to the nest a few minutes later, hung out for a while, jumped to the squirrel branch and then left. Throughout this hullabaloo the parent/deliveryman stood at the side of the nest watching. When s/he saw Harmony returning they took one look at her and got the heck out of Dodge, too! The rest of the day was listening for them and hoping for a glimpse. Harmony landed on the nest a couple of more times late in the day just to tease us. At dusk we heard them both arrive near the nest but neither showed themselves. Into darkness they were squeeing up a storm at one of the P’s we think we heard up the tree. On to the vid and pics of the day. Peace makes like a tree and leaves for parts unknown to nosh her prize. And a selection of pics of the day! Hey Harmony! Can you run to Eaglebucks and get me a coffee cake and a Cafe' Mocha?? Oh Carp! They're coming from both directions!! 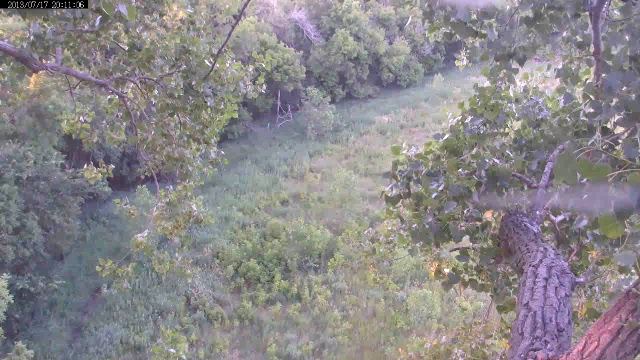 I wanna a treehouse with this view! Magic Hour on the MN Bound Nest. I promised Mom I would hang out here but I had my wingtips crossed! TeeHee! Boy, I love getting Harmony with a fake mantle!! 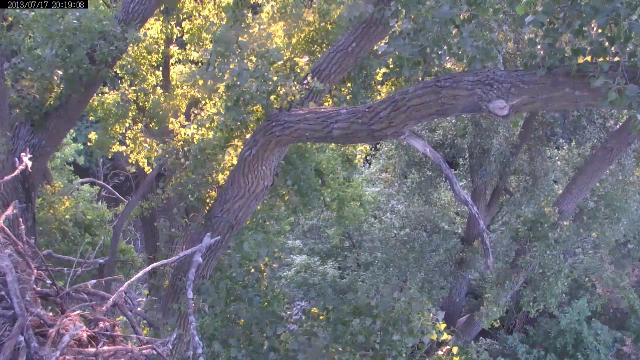 A squee in the tree to Razzle and BBC for the wonderful pics and vid from today! Thanks! Hope you had a great Wednesday and we’ll see you on the nest tomorrow!